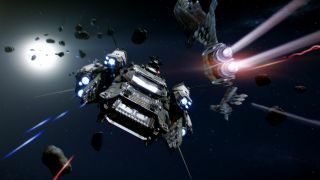 Chris Roberts' next big space sim, Star Citizen , is now on Kickstarter . The Wing Commander creator's new project has been gaining capital for a little over a week through pre-orders on Roberts Space Industries , and though it's earned over $1M, Roberts fears that website instability, or something else, is stalling potential backers. "Even today we're still having intermittent problems," Roberts tells us. "And considering we have had millions of hits and 100s of thousands of video views and almost 40,000 registered members at RSI but only 11,500 that have backed it seems that something is holding people back." Regarding the decision to supplement pre-orders with a Kickstarter campaign, Roberts says, "A couple of days ago we asked our fans whether they would like a Kickstarter option and they've told us pretty loudly they would." Those who choose to pledge with Kickstarter rather than on the official site will still have their rewards tied to their Roberts Space Industries accounts. Does the new Kickstarter option affect your intention to pledge?